Well, it has been quite the month indeed. First New York and Boston, then an impromptu mystery trip to the deep south this past week for a couple nights, and then this weekend Lauren and I headed to South Dakota for my ten-year high school reunion. After I got off the plane Thursday morning, I went back to work for the rest of the day and then we departed for Upper Sioux Agency State Park outside Granite Falls. We had our same rustic walk-in campsite as we did two years ago and were damn near the only people at the campgrounds. A roaring fire was started and we pranced around in the grass looking at stars and eating brats and strawberries. In the morning we headed on westward in search of South Dakota. We approached the border around 11am and stopped in Watertown for lunch at Pizza Ranch, though they had a terrible time keeping any food on the buffet line. After checking in at the Glanzer farm, we got cleaned up and headed over to the Vienna Town Hall for the class of 2001’s 10-year reunion. I figured we’d have at least half of the class of 22 back, but the numbers were a little smaller than expected. Kathy Van Heukelom, Brandon Hanson, Jennifer Keating, Victoria Lusk, Angela Terhark, and Josh Symens were back, as well as former classmate Jesse Van Heukelom. 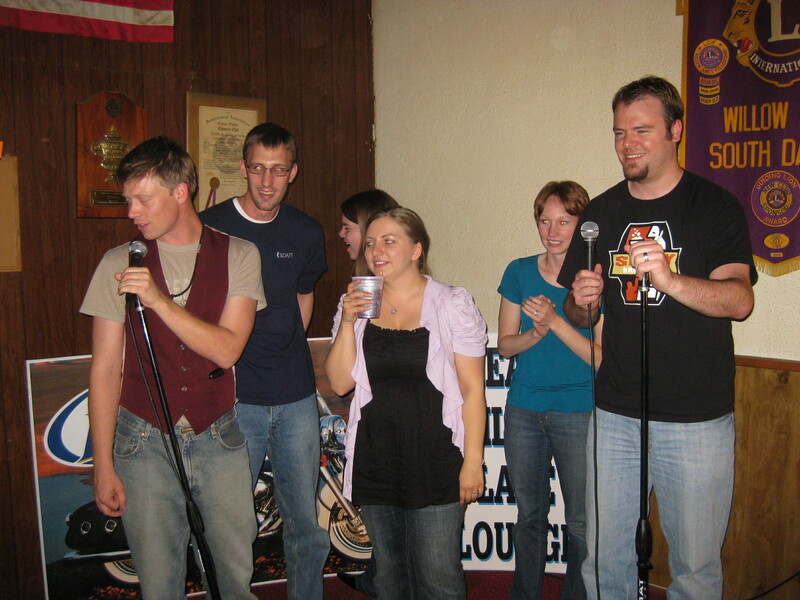 After the Vienna reunion fizzled fairly early, the gang headed back to Willow Lake for karaoke at the bar. It was one of the most fun nights ever at Willow Lake as a big crowd hit the dance floor for karaoke. Alex and Lauren teamed up to rouse the crowd with “Poker Face,” while Ann and I dazzled with “Thank God I’m a Country Boy” among other songs. Lauren and I finally arrived back at the farm around 3am. Saturday we slept very late, then Mom left to go on a walk with the dogs around the section. A mile into their walk, I decided to catch up and took off running down the road. Eventually I spotted Mom way up ahead and ran and passed her, scaring the crap out of her as she couldn’t hear me approaching due to the wind and thought she was all alone in the countryside. That night, we headed back over to Willow Lake for the 99th annual all-school reunion. I’ve heard people say it’s the longest such all-school alumni gathering in the US, but have no proof that’s true. Unfortunately the showing at the alumni gathering was even more poorly attended than our reunion party, with just 6 on hand. But, a fun time was still had and a few others showed up later that night at the dance, including Ronnie Froke, Todd Froke, and Sarah Corbin. The highlight of the night was exploring the old school building with my fellow ’01 grads, which included a stop off in the library, the NHS room, and basketball in the basement gym. Lauren got to babysit for niece Hadley while Alex and Ann attended the alumni banquet. Sunday the Bells were over for lunch along with the Alex Glanzer family. Before long though, we had to hit the long road back to Minneapolis. Maybe I was driving like a madman, but it seemed to me everyone was out for a merry Sunday joyride as I passed over 40 cars without being passed once until we got back into the city. All in all, a successful weekend and great to see many of the old classmates once again! The old gang tries singing some karaoke in Willow Lake. 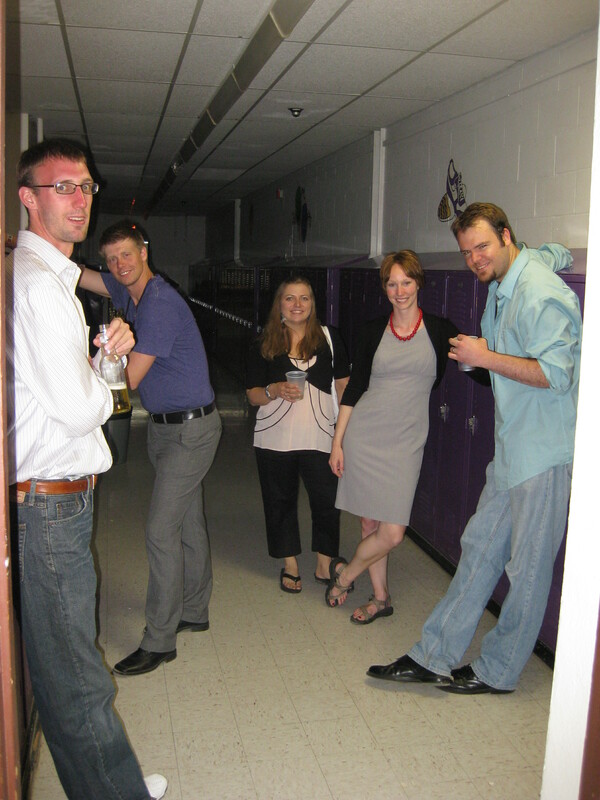 The old gang chilling in the halls of WLHS... whilst drinking. Previous Softball, DJ, Twins, Etc.